A decision aid for patients considering ICD therapy for primary prevention. This site is for patients with heart failure considering an ICD who are at risk for sudden cardiac death (primary prevention). This website will lead you step-by-step through some information on ICDs that may be helpful. We also hope this will make talking to your doctor easier. 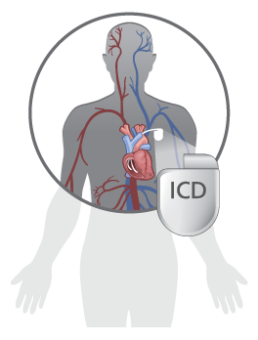 An ICD is a small device that is placed under the skin of the chest. Wires (called “leads”) connect the ICD to the heart. An ICD is designed to prevent an at-risk person from dying suddenly from a dangerous heart rhythm. When it senses a dangerous heart rhythm, an ICD gives the heart an electrical shock. It does this in order to get the heart to beat normally. My doctor has asked me to consider an ICD. Why? Due to your heart failure, you are at higher risk for developing a dangerous heart rhythm. A dangerous heart rhythm can cause you to die within minutes if not treated. Heart failure is when a heart is too weak to pump enough blood for the body. People with heart failure sometimes have breathing problems, leg swelling, and feel tired. Some people with heart failure may have no symptoms. Can the ICD be taken out? It is best not to remove the ICD unless you have an infection or are having the ICD replaced. Does getting an ICD require surgery? Yes. The ICD is put under the skin and one or more wires (called “leads”) are put into the heart. The surgery takes a few hours. You may stay in the hospital overnight. Can the ICD be turned off? Yes, it is possible to turn off the ICD without surgery. This is even recommended when a person is close to dying of another cause. Why would I want to turn off the ICD? In the future, people may reach a point where living as long as possible is not what they want anymore. This could be because of worsening heart failure or another illness. When this happens the ICD can be turned off to avoid shocks. Here is a document outlining all evidence for practice decision aids, to help you in your decision. The Patient decision aids on this website are licensed under a Creative Commons Attribution-NonCommercial-NoDerivatives 4.0 International License.The material provided on this website is for informational purposes only and is not provided as medical advice. Nothing contained in these pages is intended to be for medical diagnosis or treatment. Any individual should consult with his or her own physician before starting any new treatment or with any question you may have regarding a medical condition. No personal health information will be collected from users. Contact information is only collected if the user requests additional information regarding one of the tools. Funding by the National Institutes on Aging (1K23AG040696) and the Patient-Centered Outcomes Research Institute (PI000116-01).